Mom made Okra and onion subzi the other day. Hubbs loved it and of course Mom and Dad like it. My sister can live on Okra 5 days a week and I cannot stand more than 1 tiny piece :). Preferences. 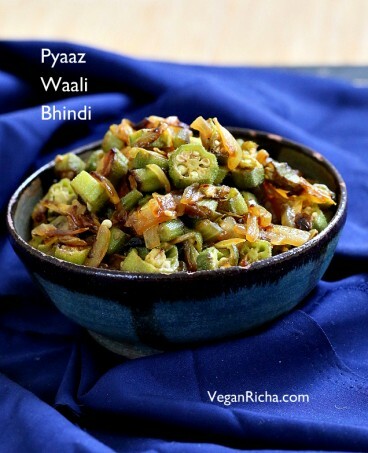 Mom has a few Bhindi recipes up her sleeve. So I stopped everyone in their tracks and took some pictures before they all finished lunch. And did you hear? Vegan MOFO is in September this year. Thats like tomorrow.. Gaah. I wont have any time to think till mid August and then I might just explode with the stress of mofo already. No Themes planned yet, no recipe and posts thought of. 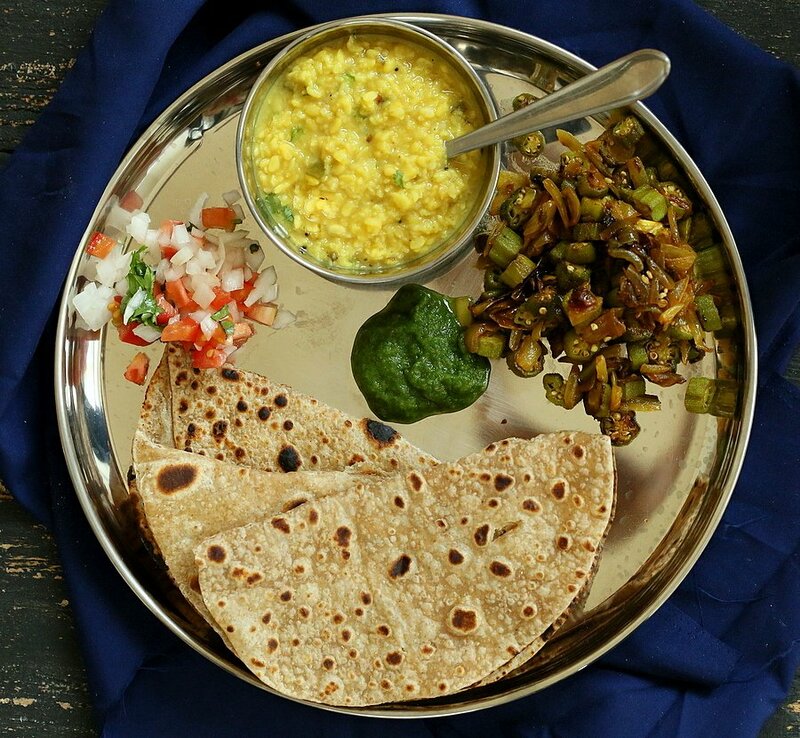 Below.. lunch with the Bhindi Subzi… Mung Dal, Okra, Mint Cilantro Chutney, Kachumbar Salad (Chopped onion, tomato, cilantro, salt, pepper, lemon juice), Roti flatbread. Also, I truly apologize for not visiting blogs this past month. It has been a crazy 2 months and continuing! No end in sight yet..
2 more ways to make Okra, with chickpea flour and with pickling spices and More Dry Veggie sides here. Add green chili and cook for 2 minutes. Add onion, mix and cook on low-medium heat until onion starts to turn translucent. 6-8 minutes. Add the Okra and turmeric, mix and cook, uncovered, on low-medium heat, for 25-30 minutes. Once Okra is cooked to preference, add salt and mix well. Take off heat. Add chili powder if you like and mix well. Notes: Cook Okra uncovered and without salt for no stickyness. Add 1/2 teaspoon cumin seeds or fennel seeds with the green chili. Add 1/4 teaspoon amchur/dry mango powder or black salt at the end and mix well. Add some garam masala to taste at the end. Hey Miss Richa! I can’t believe VeganMofo is coming soon! How about doing a collection of gluten-free bread recipes or a multicultural twist in Indian recipes? Hehe! There are so many wonderful ideas for your VeganMofo theme. I will probably be focusing on traveling and eats in Buenos Aires. I leave for Spain soon next week. 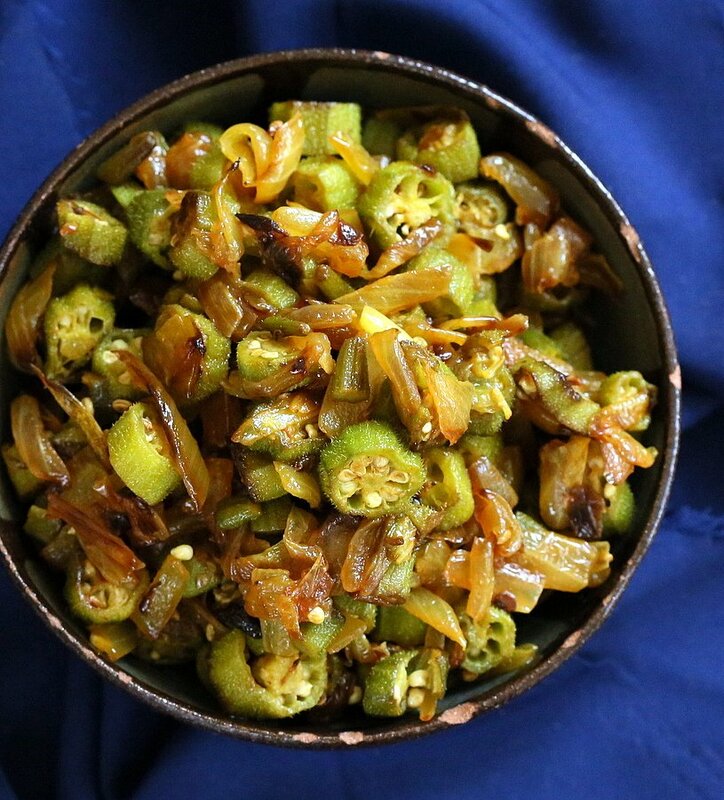 Your okra and onion stir-fry dish looks delish! Where can I find a recipe for the Roti flatbread? I’ve been addicted to making naan bread over the past two weeks! It takes loads of practice! Have a wonderful day! When I head to Seattle in the future, can I stop by? Hehe, I’m in too love with your vegan Indian cuisine. yummmy okra stir fry… have to try ur way…. Beautiful photography and scrumptious food! It’s so fun to see your mom’s recipes! They look so good. Okra grows like mad out here, but I’ve never eaten it fresh. I suppose I must try…but I still have the memory of slimy okra chunks in Campbell’s Soup from when I was a kid! I’m stressing about MoFo, too! Excited, but exhausted already :-). I’m sure you will come up with something wonderful! I am with your sis – I could live on okra. This looks so good! Okra is hard to get by over here and I hardly have ideas what to make with it. When I loved in a small university town in the west o Germany, an Indian restaurant had an okra dish I always ordered. But yours looks so much better! All those caramelized onions! i have never eaten fresh okra- only frozen, and i didn’t like it. i have to believe fresh is so much tastier, especially in this dish where it has a crispness to it. never too many mommy recipes! i can’t wait to see what you bring to the mofo table this year! I cooked okra once and hated it , maybe it would be different if I actually had someone prepare it for me that knew a thing or two about okra….since that one time I have not tried it, too bad of an experience! goodgolly that looks delicious! I haven’t eaten okra in a gazillion years but you have inspired me to dig in again! As for September ideas, maybe you could do wraps? Naan wraps and tortilla wraps and collard/cabbage/greens wraps. Radicchio wraps? Pancakes wraps! Perfect time for them because they tuck well into school lunches and soccer snack bags. 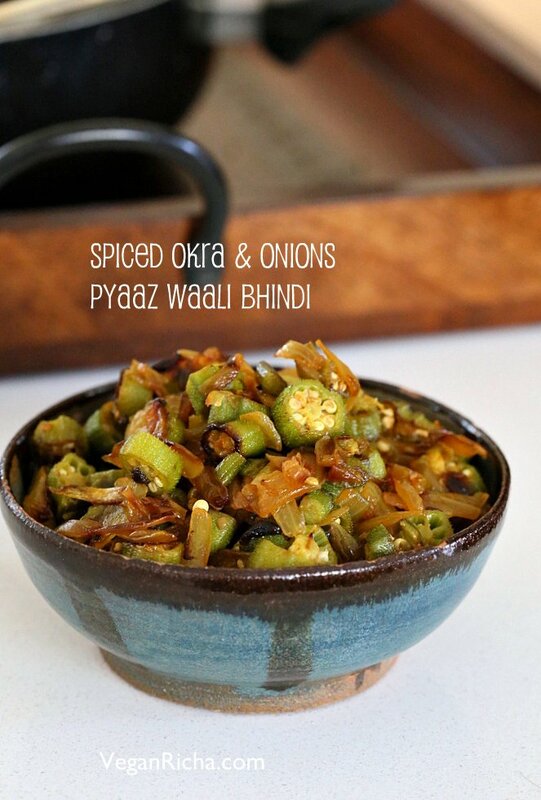 my fav recipe with okra. thank you!